With the purchase of Baby Belly Tunes, you will receive a “special code” entitling you to a “Yoga for Pregnancy” DVD, FREE One time download ~$19.99 VALUE! 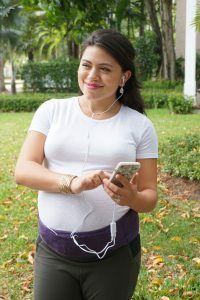 Enjoy pregnancy with support and music for both you and your baby. Adjustable, slim-fitting wrap in two convenient sizes of S-M and L-XL. 1. Purchase Baby Belly Tunes and receive a “special code” for your free YFP 60 minute yoga DVD download. 2. Continue the process to purchase Baby Belly Tunes to receive your code. 3. Your code will “zero” out the $19.99 at checkout. Note: Always place iPhone on “airplane mode” when next to your head or body for safety.